Painting on glass can add depth and realism that may not necessarily be attainable by glass and lead lines alone. Glass stainers, enamels and silver stains all can lend details and three dimensionality to your glass that otherwise may look flat, lifeless and two dimensional. SCRUBS, used to remove paint to produce highlights and detail. Use Applicator brushes for applying paint over large areas. Most useful for applying a coat of paint as first step in matting. Good applicator brushes are soft and broad in order to evenly distribute the paint. Peter McGrain has found the perfect Blending Brush. The Symphony Badger Blender is not as floppy as our Royal Series below and is much more affordable than the European badger blenders. The added springiness gives you more control when blending mats or stippling. The Symphony Blender is 3" wide. They are a fine quality brush with all of the preferred qualities. 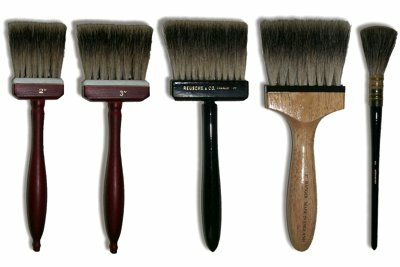 Soft, springy bristles that don't attract or hold paint. Plus, these are actually affordable. The perfect alternative to pricey French or English Badger Blenders. #R BR313A Three inch English Badger Blender a superior quality brush with a comfortable handle. The holy grail of badger blenders. #R BR326 German Round Badger Blender, size 6, approx 3/4 to 1' around at tip. 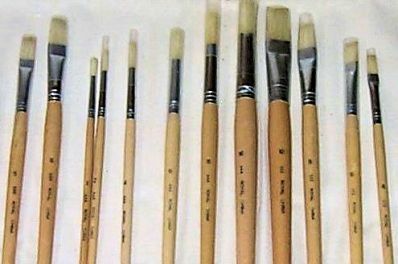 Our assortment includes 12 brushes of superior quality white bristle brushes, priced right! Package includes a variety of flat and round scrubs. You should find a scrub for every application in this package, but feel free to shape these brushes with scissors to fit your needs. 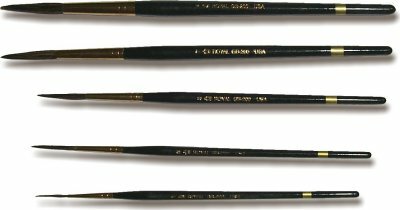 3-1/4" PALETTE KNIFE (#R PK) is the preferred method for mixing paints, gum arabic and the painting medium.